Financing a home can be complicated. We’re here to help. Homeownership may be closer than you think. 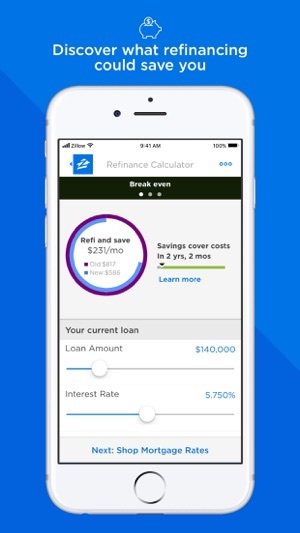 Use Zillow calculators to find out what you can afford, and gain control of the home-finance process with live, customized mortgage rates from multiple lenders, all in one place. Find a local lender in minutes who can help you get pre-qualified for a mortgage, and show sellers that you’re a serious and credible buyer. Our app makes it easy to reach a local lender, whether you’re looking to purchase or refinance a home. Remember, it’s best to talk to at least three different lenders when shopping for a mortgage to find the right loan for you. • Find out how much you can afford to spend on a new home with our home affordability calculator. • Estimate your monthly mortgage payment with our mortgage payment calculator. • Compare mortgage rates, APRs, fees, monthly payments, loan lengths and more with customized quotes from 100+ lenders. • Get real-time mortgage rates based on your location and loan requirements. •Find a local lender to discuss your loan options and help you get pre-qualified to buy a home. • “Call lender” function allows you to contact lenders directly through the app. • Compare the latest refinance rates to see if you can lower your interest rate. • Find a HELOC lender to see if you can tap into your home equity. • HARP quoting provides custom refinance rates for homeowners who are upside down on their mortgage. • Easily share results with your spouse or partner from the app. 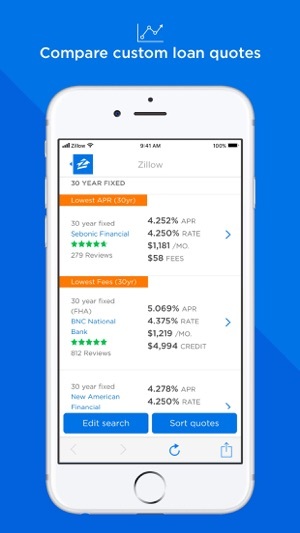 We are always working to improve Zillow’s apps. Please continue to send feedback to mortgagesupport@zillow.com. We’ve made updates to make it easier to find a local lender who can help you get pre-qualified for a mortgage. We’re always working to improve our apps. Please continue to send feedback to mortgagesupport@zillow.com. Zillow can find you House for sale/rent, lot for sale or rent an apartment. Set your parameters and you have results. On the top it is connected with local county property site. From property tax tab it will tell you complete value history and can also take you to county tax website directly for that particular property. Where you can see real detailed property description and tax payments history. 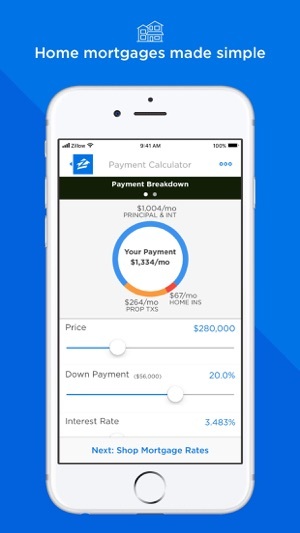 Zillow calculator app can give you idea of monthly payment without going to banker. If you request for finance the house, someone may call within reasonable time. Zillow made the house buying so easy. this is a great app! I have used it in recent home purchases and actually had good leads on good mortgage lenders. It would be nice to have this as a "widget" on my phone such that it would come up with other widgets at the home screen, like the Stocks app and news, etc. It would be nice to see a graph of what the mortgage rates are doing on a day-to-day or weekly/monthly basis. wouldn't that be great? I don't see how to enable that right now. 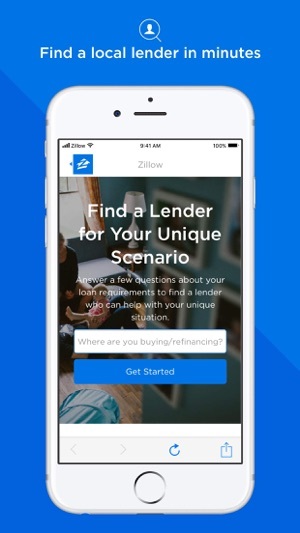 it shows Zillow real estate on the list of apps but not Zillow mortgage. "Zillow is your friend," I always say. I really enjoy the app. I find that it has some bugs, which are aggravating. It is difficult to change an entry when you make a mistake on the home affordability calculator. The screen is covered sometimes by what is supposed to be the final number that you can afford. What this does is block the top of the screen to where you can’t see what you are inputting. Very frustrating. I tend to give up. The idea behind it is great. Just would like for it to function as Intended.